By the sound of it, you've probably guessed what this route looks like and where you are headed. Out of the four, this is probably the easiest one to follow and is the second shortest at 163 miles. At a super relaxed pace, you'll knock this out in 6-7 hours with a few good meals and at least one dip in the water. You'll start this ride off by heading east on I-80 and before heading south once you hit the 89. That'll put you in downtown Truckee which is a prime spot for a hearty meal. We hit Marty's Cafe a few weeks back and the Green Chile & Chorizo Burrito did not disappoint. If you are not already in a food coma, hop on the 89 South and you'll soon be on the western shore of Lake Tahoe. Expect it to be relatively slow going while you are riding along the Lake as it will be prime tourist season and lots of people will be enjoying the views. At the bottom of the 89, you'll run into Emerald Bay State Park. As you can see from the pic below, this is one of the most iconic spots to view Lake Tahoe from. Continue on down the road until you with the 50E/Lake Tahoe Blvd. Bang a left and continue on through South Lake Tahoe and over to the eastern shore. There's a glorious tunnel you can't miss and plenty of spots to snap a pic along the water. At the top of the lake, take a left onto the 28 South and then a few miles later, you'll take a right onto the 267 North back towards Truckee. If you have not taken a dip in the water yet, yer nuts, but there's still one more chance. Donner Lake sites right outside of Truckee and is a great spot to relax before climbing back up and over the Donner Pass. Pro Tip: Taking the slow ride up Donner Pass Rd rather than jamming up I-80 West has it's benefits. 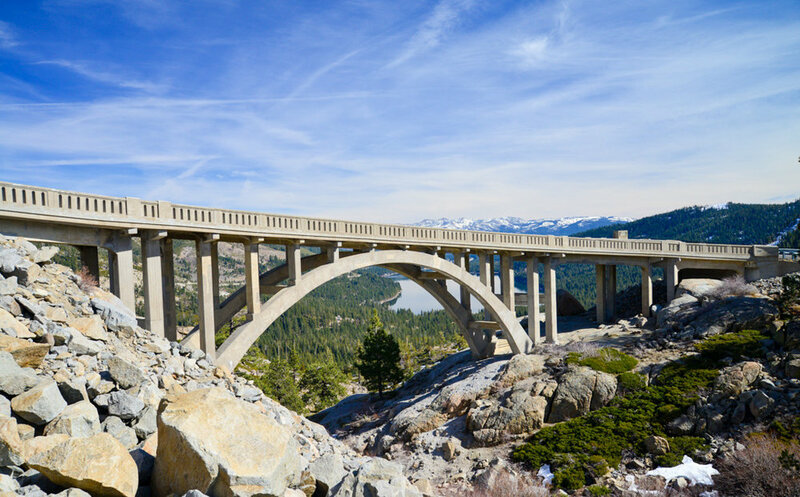 The biggest would be crossing over the Donner Summit Bridge which was designed by the same guy that did the Bixby Bridge in Big Sur.